Click above or below to read our FIRST Theatrical Review. 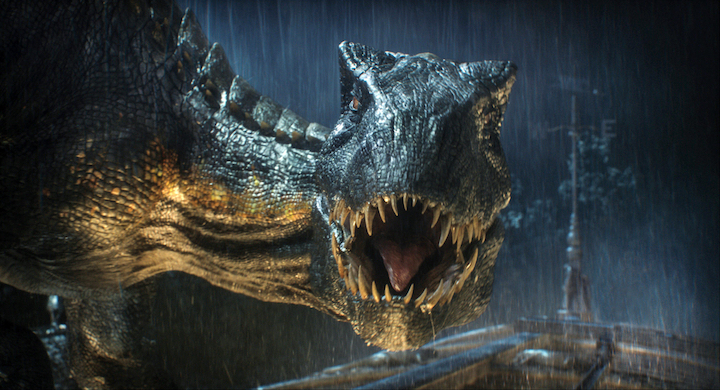 “Jurassic World: Fallen Kingdom“, in what is now the fifth “Jurassic” film, picks up roughly 3 years after the events of the “Jurassic World.” where a U.S. Senate hearing is determining whether or not the remaining Isla Nublar dinosaurs should be saved from the impending volcanic eruption. Dr. Ian Malcolm (Jeff Goldblum) believes the dinosaurs should be left to die as this would remedy the numerous mistakes that have been caused by the creatures created by John Hammond. It’s also revealed that Claire Dearing (Bryce Dallas Howard) has established a Dinosaur Protection Group. She’s enlisted by Benjamin Lockwood (James Cromwell), Hammond’s former partner, to help rescue the creatures. Lockwood’s partner, Eli Mills (Ted Levine) is concerned on the rescue of Blue, the last living Velociraptor, so Owen Grady (Chris Pratt) is enlisted for the mission. Upon arrival on the island, we soon find out that things aren’t going to go exactly as planned. It should come to no single persons surprise that Director J.A. Bayona is able to tell a story mixed with real, honest thrills, but also with pure emotion. Having directed one of my favorite films of the past in 2007’s “The Orphanage“, his ‘mainstream’ debut is one of excitement. Helming a “Jurassic” film is no easy task, but the fact that Steven Spielberg had faith in Bayona should tell you something. Having said that, it is worth noting that Spielberg, and “Jurassic World” director Colin Trevorrow served as executive producers on this film. “Kingdom” has no short of action in any one sequence, with Bayona creating a sense of edge-of-your-seat thrills right from the jump. Even the quieter, dialogue driven moments (like that of Claire trying to convince Owen to join her) have an energy to them, simply because the viewer knows something big is coming. The never-ending dino carnage, particularly that of the latter half of the film, are some of the best the entire series has offered. I don’t have to sell this film to you, you knew from the first teasers and mentions of the film, whether or not you were going to cough up your hard earned bucks to see this one. I personally watched the film in Digital 3D (via Real D) with DTS:X. The film is out with a Dolby Atmos mix, which will be my next viewing.